Whoever thought the now highly successful 2017 Apple iPad was a drab during the initial days soon after the launch, are in for a surprise. Let us remind you the lack of the smart keyboard support or option had pinched many especially after the iPad Pro, the tablet which has set the bars high for the iPads. However, the Logitech’s slim folio keyboard case for the 2017 iPad has filled the gap that too with a 4-year battery life and a back support for the iPad that are its takeaway features. You can now try out the product hands-on with 2017 iPad rental in Dubai and let us refresh you, the new iPad Air 2 replacement is one of the most popular iPads(iPad Pro, of course, is the blue-eyed boy among iPads) as of today. Apparently, those who have tested the product hands-on have found the Logitech’s slim folio keyboard quite tough and durable. The 2017 9.7 inch iPad easily fits into the back cover, which is made of extremely hard plastic and can take the drops from heights in a stride thereby avoiding the scratches on the iPad. The keyboard that wraps the hard plastic keys is made of a textured canvas like material. The keyboard was found to be extremely comfortable to work on allowing the speed typing which is extremely difficult with the iPad sans keyboard. The keyboard can be supported on the keypad on a magnetic strip that firmly holds the iPad in place, however; reportedly, the connection is only strong enough that allows careful typing in the lap. Thanks to the 4-year battery life with the normal usage, the device will not have to be charged for a long long time. The keyboard, when paired with the iPad, is automatically turned on and once set in the typing position is ready to get started by all means. Another feature that stands out when compared with the smart keyboard is the row of shortcuts for calling Siri, Spotlight and the volume control and adjusting screen brightness. The tough iPad support is another feature that the Apple’s Smart Keyboard lacks, not to mention the lack of battery support for it. However, the Logitech’s slim folio keyboard is said to not have the same look and finish of the Apple’s keyboard. If you are not the one to care about the aesthetics of the 2017 iPad, then you can as well keep the keyboard attached forever without going through the hassles of removing it after every use. Not only does the device provide the keyboard, it also acts as a complete guard for your iPad against drops, spills, and scratches. 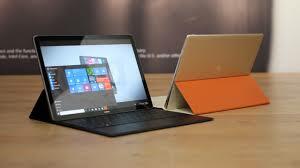 At VRS Technologies, we offer latest products on rent, hence if you are keen to test any of the gadgets launched in the market, try our rental services where we offer laptop rental, iPad rental in Dubai. Contact us at +971 55 5182748 or visit our website www.vrscomputers.com for more information.